Storrs was an American composer who was a prolific writer of hymns. He is best known for the much-loved Christmas carol, “It Came Upon the Midnight Clear” (1850). Richard Storrs Willis was born into a prominent New England family distinguished in the world of art and belles lettres. Several siblings were also accomplished and gained fame: Older brother Nathaniel Parker Willis (1806-1867) was an author, poet and editor, and his sister Sara Willis Parton, (1811-1872) become a well known writer under the pseudonym Fanny Fern. As a youth in the city of Boston, Richard Storrs Willis had the advantage of excellent schooling that prepared him for Yale College. He was one of the first notable musicians to come out of Yale, graduating in 1841 before the School of Music even existed. At Yale he was elected president of the Beethoven Society and devoted himself to writing compositions for the college orchestra and choir. After graduation Willis went abroad to study music at Frankfort. During his seven years in Germany, Willis studied music theory under the celebrated German professors, conductors and composers, including the great Mendelssohn. Amoung Mr. Willis’ most precious mementoes were his series of compositions that were carefully reviewed by Mendelssohn, who revised several of the scores. Doctor of Music was bestowed upon him by The Landgrave of Hesse-Darmstadt. 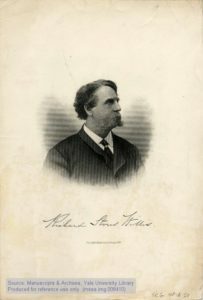 Willis returned to America to continue composing and furthered his influence as a music critic and journal editor, founding a magazine devoted to the fine arts, known as Once a Month: A Paper of Society, Belles-Lettres and Art, which published its first issue in January 1862. In the midst of all these activities he found time to write an admirable work on church music, which elicited much praise from the London Athenaeum. Later he published a book of church chants, besides many student songs and lyrical compositions. During the Civil War a prize was offered for the best national song. Mr. Willis’ composition “Anthem of Liberty” won the distinction. He wrote other patriotic songs during the war including the popular “Why, Northmen, Why”. In 1876 his national songs and miscellaneous compositions were published by Galignani in Paris, under the title of “Waifs of Song” and the proceeds of the sales were donated to the poor. The Glen-Mary Quadrilles- composed by Allen Dodworth and first published in 1847 were possibly named after the famous Waltzes. Dodworth was an English born author, arranger, composer, wind player, bandmaster, and well-known New York dancing master. He wrote 86 works amoung them: Dancing and its relation to education and social life, with a new method of instruction , including a complete guide to the cotillion (German) with 250 figures, originally published in 1885. *Parts of text based on and extracted from: History of Detroit, a chronicle of its progress, its industries, its institutions, and the people of the fair City of the straits… [Vol. 2] Pages 839- 842 , by Paul Leake , The Lewis Publishing Company, Chicago, New York 1912.